Families do not fall neatly into the binary categories of single parents and married couples. For one thing, there are growing numbers of cohabiting parents. More importantly, structure is only one factor influencing children’s economic opportunities. Other family characteristics matter too, as argued in a new report from the Center for American Progress (CAP). 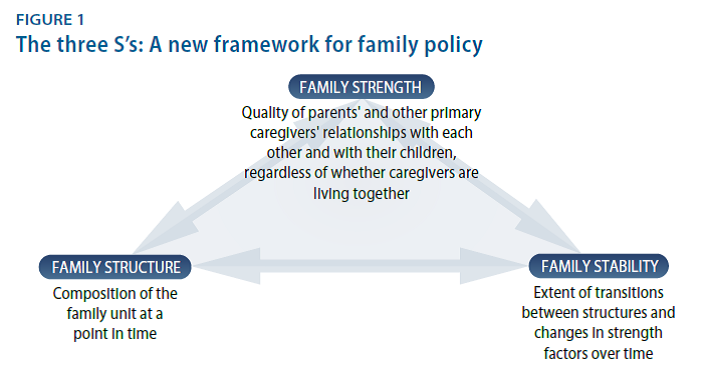 The CAP authors, Shawn Fremstad and Melissa Boteach, propose a framework built around “three S’s”: Family Structure, Family Stability and Family Strength. It is clear that stability matters a lot for children. There is growing evidence, in fact, that instability has a greater negative impact than family structure on some cognitive and health outcomes. Family instability has also been linked with conflict in the household. Some of the impact of changes in family structure on child outcomes, particularly behavioral outcomes, can be attributed to the association between conflict and instability. In her recent book Generation Unbound, our colleague Isabel Sawhill shows that an increasing proportion of non-martial births are to cohabiting couples rather than to a single mother. The problem is that over half the parents cohabiting when their child is born have split up before the child reaches kindergarten. Of course some married couples split up before their child turns five too: around 20% according to latest estimates. What matters most is the stability or the lack of it; structure matters to the extent that it supports that stability. Looking at the actual experience of children within families over time is more important than a crude binary categorization. CAP’s third S – Strength – is harder to pin down. They define family strength as a combination of commitment, conflict levels, emotional support, and social networks. This is a good start. To us, this seems to be about the quality of the relationships in the family. Bluntly: are you a good parent and a good spouse? Our own research finds that parenting quality among mothers varies by family structure. It is the kind of parents you have – rather than just the number – that seems to really count. Family strength and quality are hard to assess, not least because they require value judgments on the part of the researcher. How do we define a ‘strong’ family or a high-quality parent or spouse? Even if we can, what kinds of policies can effect change in this realm? This is politically as well as empirically difficult terrain. But it is also the most important in terms of future research. The concept of ‘the family’ covers a wide range of institutional frameworks, as well as sets of relationships, forms of commitment and types of behavior. Families are defined over time, rather than in any single moment. They are, in short, what we make them. The key is to make sure they work for children.